Se sei un tipo mattiniero, si possono prendere i palloni ad aria calda come vanno oltre la casa pur avendo il caffè sul lanai. Puoi lasciare i parchi in anticipo per una pausa pranzo e sederti nel soggiorno con il cursore a scorrimento triplo aperto e guardare i bambini nuotare nella piscina privata Oppure puoi lasciare riposare i piccoli (abbiamo un baby monitor nella camera dei bambini ad uso tuo così puoi sentire i più piccoli mentre ti rilassi sul lanai e goditi il sole prima di tornare ai parchi per le attività serali. Tre camere da letto, master con letto matrimoniale, seconda camera con letto matrimoniale e camera per bambini con 3 letti singoli. La zona cucina esterna con lavello, costruito nel grill a gas e bruciatore laterale è un luogo ideale per preparare la cena. Rilassatevi e godetevi il vostro soggiorno. Abbiamo una camera da letto per bambini su misura progettata con soppalco per la lettura o giocare, e letto singolo livello superiore. C'è una scatola di giocattoli nella camera dei bambini e libri nell'armadio. C'è un passeggino, seggiolone, seggiolino per a tavola, rotaie letto, e letto portatile con fogli per i più piccoli. C'è un parco giochi della comunità. Si può andare a pesca, cattura e rilascio, in due laghi della comunità. 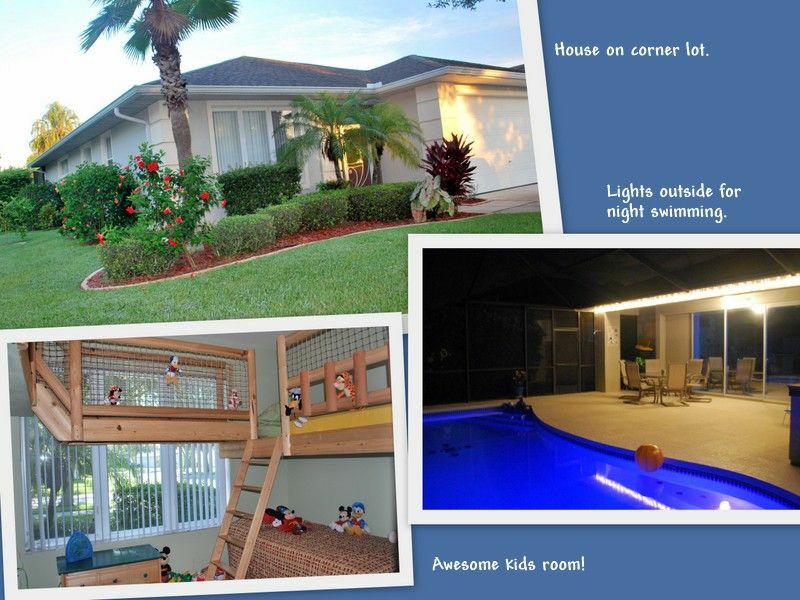 Convenient location to disney and very family oriented. Highly recommend! We had a fantastic stay. My children loved the kids room. The heated pool is nice in December. We loved the little extras like Christmas decorations. I highly recommend staying here and will try to stay here again for our next Disney trip. Our girls loved not having to share the pool, my husband & I loved that the bushes made it much more private. The master bed was a little too firm for us but overall enjoyed our stay! A very welcoming, clean, family friendly home! Our children loved their bedroom and all of the Disney/Mickey features around the house. We really hope to be back next time we visit Florida - Thank you so much Pat and Bill! We are from Germany and did stay for 15 day. The contacts to Patsy and Bill were very good we die get to Know-how everything we needed before we Even got there ! The house was very clean and the House provides erverything you can think of! We have had a Problem with the Pool so we wrote a Message in the evening and someone directly came over at Night to Check and the Pool Boy came the next Morning. Perfekt Service! The location of the House is really close to everything Restaurants and Disney is only 10 Min away (without Traffic). We really had a Great vacation with to many nice Details in the House (Disney bed sheets, Disney Toaster which actually toasts a mouse on your bread and much more...) we would always came and stay here again. Thanks for the great review! We are glad that you were pleased with your stay in our vacation home. We are very lucky to have a good management company and cleaners that can and will respond to our guests needs quickly. It made me laugh reading your comment about the toaster that will "toast a mouse on the bread" (just a little something fun for the kids). Love to have you as guest again anytime. We're glad you enjoyed your stay in our vacation home during your first visit to Disney. We will be going down in a few weeks and will check on the shades and other things you mentioned that might need attention. We keep the older tv in the kids room because it will play the older Disney VHS tape collection that we have in that room. We try to keep up with things that need to be done around the house (it gives us an excuse to come down and enjoy our house ourselves once in a while). Great home for our family of 6! The owners were easy to contact and provided us with any information that we needed. We had a wonderful time. Sabrina, we are glad that you and your family enjoyed your stay at our house. We appreciate your great review. Hope to have your family again some day.